LatinaLista — The following remarks were delivered by President Obama at the memorial service for former South African President Nelson Mandela at the First National Bank Stadium in Johannesburg, South Africa. To Graça Machel and the Mandela family; to President Zuma and members of the government; to heads of states and government, past and present; distinguished guests — it is a singular honor to be with you today, to celebrate a life like no other. To the people of South Africa — people of every race and walk of life — the world thanks you for sharing Nelson Mandela with us. His struggle was your struggle. His triumph was your triumph. Your dignity and your hope found expression in his life. And your freedom, your democracy is his cherished legacy. Born during World War I, far from the corridors of power, a boy raised herding cattle and tutored by the elders of his Thembu tribe, Madiba would emerge as the last great liberator of the 20th century. Like Gandhi, he would lead a resistance movement — a movement that at its start had little prospect for success. Like Dr. King, he would give potent voice to the claims of the oppressed and the moral necessity of racial justice. He would endure a brutal imprisonment that began in the time of Kennedy and Khrushchev, and reached the final days of the Cold War. Emerging from prison, without the force of arms, he would — like Abraham Lincoln — hold his country together when it threatened to break apart. And like America’s Founding Fathers, he would erect a constitutional order to preserve freedom for future generations — a commitment to democracy and rule of law ratified not only by his election, but by his willingness to step down from power after only one term. But Madiba himself strongly resisted such a lifeless portrait. Instead, Madiba insisted on sharing with us his doubts and his fears; his miscalculations along with his victories. It was precisely because he could admit to imperfection — because he could be so full of good humor, even mischief, despite the heavy burdens he carried — that we loved him so. He was not a bust made of marble; he was a man of flesh and blood — a son and a husband, a father and a friend. And that’s why we learned so much from him, and that’s why we can learn from him still. For nothing he achieved was inevitable. In the arc of his life, we see a man who earned his place in history through struggle and shrewdness, and persistence and faith. He tells us what is possible not just in the pages of history books, but in our own lives as well. But like other early giants of the ANC — the Sisulus and Tambos — Madiba disciplined his anger and channeled his desire to fight into organization, and platforms, and strategies for action, so men and women could stand up for their God-given dignity. Moreover, he accepted the consequences of his actions, knowing that standing up to powerful interests and injustice carries a price. Mandela taught us the power of action, but he also taught us the power of ideas; the importance of reason and arguments; the need to study not only those who you agree with, but also those who you don’t agree with. He understood that ideas cannot be contained by prison walls, or extinguished by a sniper’s bullet. He turned his trial into an indictment of apartheid because of his eloquence and his passion, but also because of his training as an advocate. He used decades in prison to sharpen his arguments, but also to spread his thirst for knowledge to others in the movement. And he learned the language and the customs of his oppressor so that one day he might better convey to them how their own freedom depend upon his. 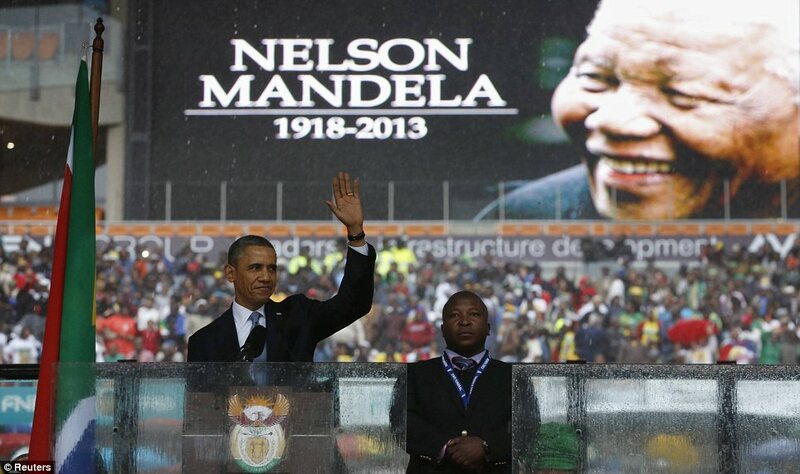 Mandela demonstrated that action and ideas are not enough. No matter how right, they must be chiseled into law and institutions. He was practical, testing his beliefs against the hard surface of circumstance and history. And finally, Mandela understood the ties that bind the human spirit. There is a word in South Africa — Ubuntu — a word that captures Mandela’s greatest gift: his recognition that we are all bound together in ways that are invisible to the eye; that there is a oneness to humanity; that we achieve ourselves by sharing ourselves with others, and caring for those around us. We can never know how much of this sense was innate in him, or how much was shaped in a dark and solitary cell. But we remember the gestures, large and small — introducing his jailers as honored guests at his inauguration; taking a pitch in a Springbok uniform; turning his family’s heartbreak into a call to confront HIV/AIDS — that revealed the depth of his empathy and his understanding. He not only embodied Ubuntu, he taught millions to find that truth within themselves. It took a man like Madiba to free not just the prisoner, but the jailer as well — to show that you must trust others so that they may trust you; to teach that reconciliation is not a matter of ignoring a cruel past, but a means of confronting it with inclusion and generosity and truth. He changed laws, but he also changed hearts. For the people of South Africa, for those he inspired around the globe, Madiba’s passing is rightly a time of mourning, and a time to celebrate a heroic life. But I believe it should also prompt in each of us a time for self-reflection. With honesty, regardless of our station or our circumstance, we must ask: How well have I applied his lessons in my own life? It’s a question I ask myself, as a man and as a President. We know that, like South Africa, the United States had to overcome centuries of racial subjugation. As was true here, it took sacrifice — the sacrifice of countless people, known and unknown, to see the dawn of a new day. Michelle and I are beneficiaries of that struggle. But in America, and in South Africa, and in countries all around the globe, we cannot allow our progress to cloud the fact that our work is not yet done. The struggles that follow the victory of formal equality or universal franchise may not be as filled with drama and moral clarity as those that came before, but they are no less important. For around the world today, we still see children suffering from hunger and disease. We still see run-down schools. We still see young people without prospects for the future. Around the world today, men and women are still imprisoned for their political beliefs, and are still persecuted for what they look like, and how they worship, and who they love. That is happening today. And so we, too, must act on behalf of justice. We, too, must act on behalf of peace. There are too many people who happily embrace Madiba’s legacy of racial reconciliation, but passionately resist even modest reforms that would challenge chronic poverty and growing inequality. There are too many leaders who claim solidarity with Madiba’s struggle for freedom, but do not tolerate dissent from their own people. And there are too many of us on the sidelines, comfortable in complacency or cynicism when our voices must be heard. The questions we face today — how to promote equality and justice; how to uphold freedom and human rights; how to end conflict and sectarian war — these things do not have easy answers. But there were no easy answers in front of that child born in World War I.
Nelson Mandela reminds us that it always seems impossible until it is done. South Africa shows that is true. South Africa shows we can change, that we can choose a world defined not by our differences, but by our common hopes. We can choose a world defined not by conflict, but by peace and justice and opportunity. We will never see the likes of Nelson Mandela again. But let me say to the young people of Africa and the young people around the world — you, too, can make his life’s work your own. Over 30 years ago, while still a student, I learned of Nelson Mandela and the struggles taking place in this beautiful land, and it stirred something in me. It woke me up to my responsibilities to others and to myself, and it set me on an improbable journey that finds me here today. And while I will always fall short of Madiba’s example, he makes me want to be a better man. He speaks to what’s best inside us. After this great liberator is laid to rest, and when we have returned to our cities and villages and rejoined our daily routines, let us search for his strength. Previous Post Dying deportee refused by immigration officials to reunite one last time with family in U.S. Thank you for providing the Transcrip of President Obama’s Speech. I tried to print the transcript but could get the print button to work. I printed your page featuring the transcipt and it printed 36 pages of everything but the transcript. In fact, the transcript was printed as pages 31-36 and the right part of the page was cut off making all 36 pages unusable.. I am shocked and disappointed and will not use your service again. Dying deportee refused by immigration officials to reunite one last time with family in U.S.